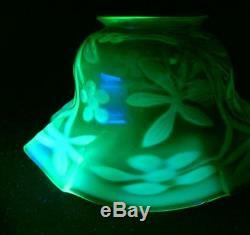 ANTIQUE URANIUM VASELINE OPALESCENT GREEN GLASS OIL LAMP LIGHT SHADE ART NOUVEAU. 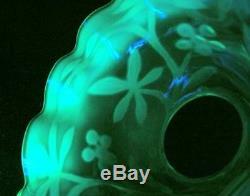 EXQUISITE ANTIQUE VICTORIAN URANIUM & OPALESCENT GLASS SHADE. 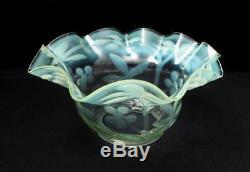 EXCEPTIONAL LARGE SIZE & STUNNING PATTERN! 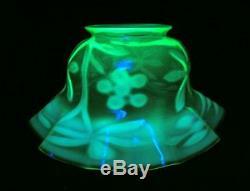 Presenting a stunning antique Victorian era uranium (vaseline) citrine green and opalescent glass lamp or light shade. This exquisite piece has a wonderfully elegant shape, stunning Art Nouveau design and striking uranium green and opalescent colour combination. 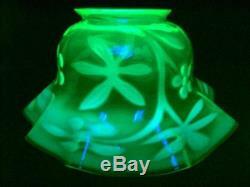 This fabulous larger sized shade has been crafted in an exquisite radiant uranium green glass. 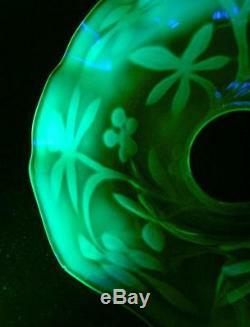 This exceptional piece has an incredibly strong radiant glow under a UV blacklight. 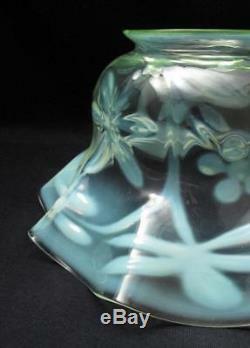 A wonderfully stylish and elegant flowing pattern featuring leaves and flowers appears in an opaque opalescent vaseline glass encased within the uranium green shade. We believe this pattern is referred to as "Horse Chestnut Leaf" which was produced by the Stourbridge firm, Richardson England circa 1890. The flowing, organically shaped design so beautifully encapsulates all of the style and elegance of the and Art Nouveau or Arts and Crafts period! The stunning design is beautifully accentuated with light passing through the glass and would look truly sensational with the warm flickering glow of an oil lamp illuminating its surface. This piece would add a warm and inviting ambiance to any home. This exquisite shade is presented in good antique antique condition with one tiny flake of a nibble to the waved rim noticeable only on close examination but mentioned for complete accuracy and in no way detracting from the beauty of the piece. 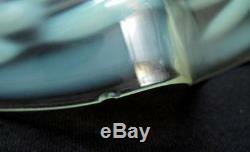 There is also one slither of a chip to the more slender rim which would be concealed within the gallery. This piece is breath takingly beautiful and presents exceptionally well. This exceptionally impressive shade measures approx 130mms in height, measures 260mms in diameter at the wide waved rim with an internal gallery opening of 82mms and a total gallery diameter of 102mms. 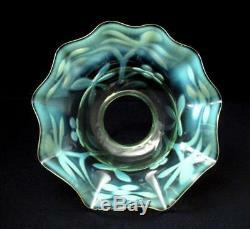 This exquisite piece would make an outstanding addition to any lamp, lighting or uranium / vaseline glass collection. 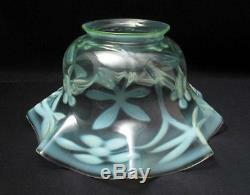 This truly elegant uranium / vaseline glass shade would add a lovely warm and inviting ambiance to any home it graces. All items are professionally packaged to the highest of standards. International buyers are most welcome. Sorry, no personal cheques accepted. All items are professionally packaged using quality materials. We individually hand select quality vintage, antique, well designed and hand crafted pre-loved items, and proudly offer our finds for sale. We aim to describe and visually represent our items as accurately as possible. Get images that make Supersized seem small. Tailor your auctions with Auctiva's. Attention Sellers - Get Templates Image Hosting, Scheduling at Auctiva. 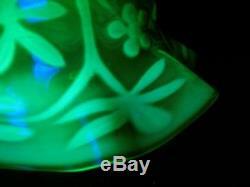 The item "ANTIQUE URANIUM VASELINE OPALESCENT GREEN GLASS OIL LAMP LIGHT SHADE ART NOUVEAU" is in sale since Thursday, August 2, 2018. 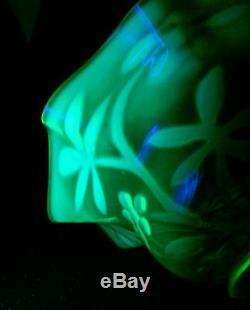 This item is in the category "Collectables\Homeware, Kitchenware\Lighting\Shades". The seller is "threetreefrogs" and is located in melbourne.